It’s starting to look and feel a little bit like fall here in Iowa and I’m enjoying every bit of it! This is one of my favorite times of the year, especially for the FOOD! I am already looking forward to all of the yummy food for Thanksgiving and Christmas. With this new season brings AE’s seasonal products that everyone anxiously waits for. (I’ve even heard of egg nog lovers freezing AE Egg Nog to hold them over until the next year!) I’m sharing a recipe with egg nog soon, but today I’m sharing a recipe using AE After Dinner Mint Chocolate Milk. 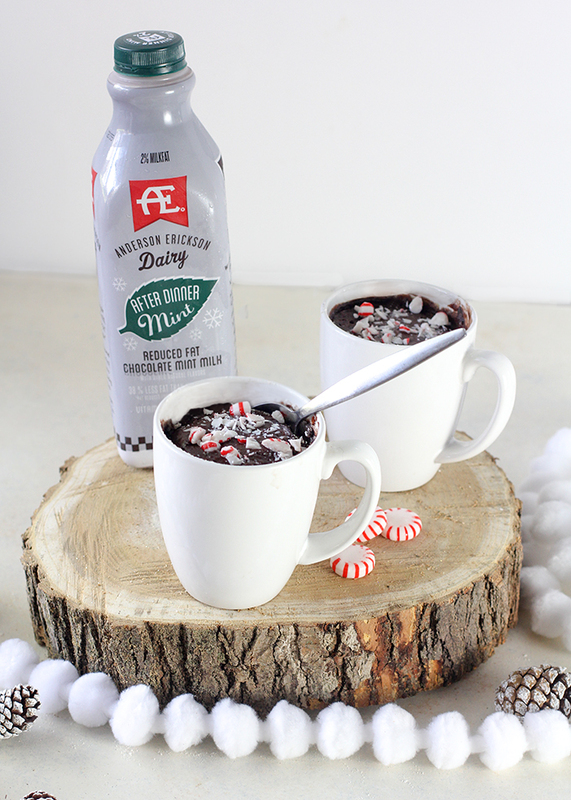 Yes, everything you love about AE Chocolate Milk with a little Holiday twist! I have always been a little skeptical of the mug cakes that you see on Pinterest. How can you make a delicious dessert in 60 seconds? I’m the type of person who craves a chocolate dessert at 9pm when I have no desire to turn the oven on and bake a whole batch, so I needed to give this a try to see if it actually works. After trying a few recipes that weren’t the best, I knew I wanted to experiment and make a mug brownie that tasted like an actual brownie. 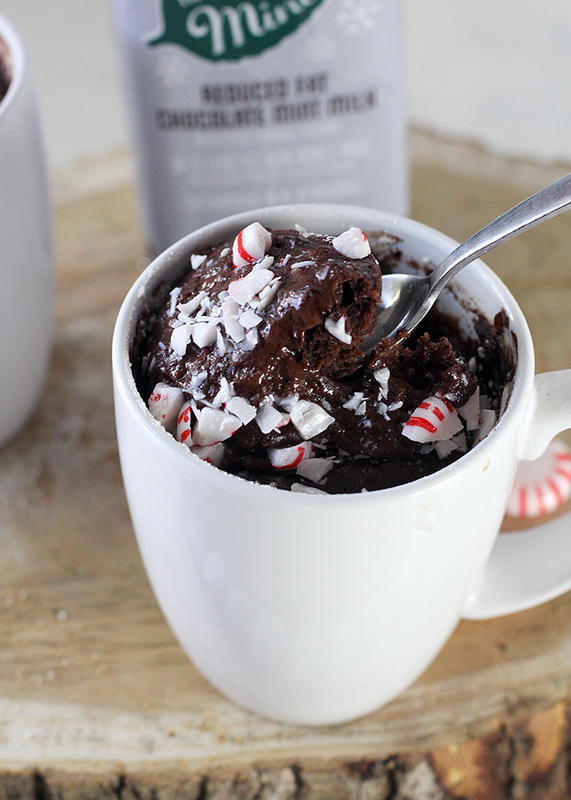 A messy kitchen and many mugs later, this Minty Mug Brownie really takes the cake…. Minty Mug Brownie made in Microwave! In the bottom of a mug, add the AE After Dinner Mint Chocolate milk, melted butter and vanilla. Mix well with a fork. Add baking cocoa and mix well. Place in microwave for 60 seconds. Check on the cake. Depending on your microwave, add 5-10 seconds until done. The center should still be moist. Add peppermint candies if desired. *note: This should be like a brownie batter consistency. If for some reason it is too thin, add a little flour. If it is too thick, add a little AE After Dinner Mint. Look for AE’s After Dinner Mint Chocolate Milk and Chocolate Hazlenut Milk in stores near you! 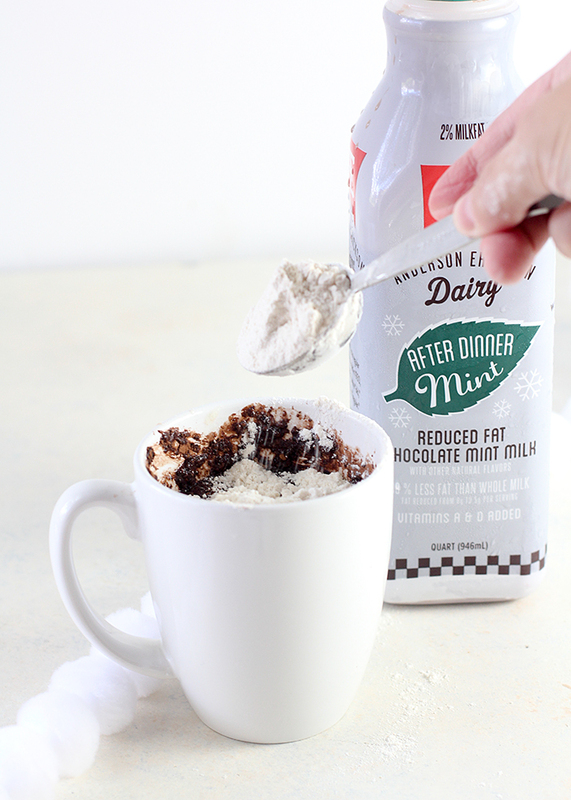 They are delicious to drink by the glassful or used in recipes like this Minty Mug Brownie!